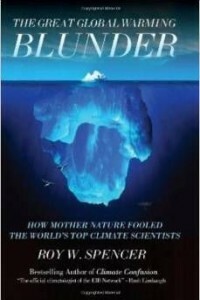 The key hypothesis of the climatologist who wrote this book is quickly summarised as follows: The warnings of an imminent global climate collapse have not been scientifically substantiated. Nor is their any scientific evidence that the warming registered over the past 100 years (by 0.7 centigrade) was caused by greenhouse gases. Just because an increase in carbon dioxide emissions coincided with the warming does not necessarily imply that the emissions actually caused the warming. Spencer argues that researchers, some of whom develop apocalyptic visions, have not even considered the possibility that the increase in temperature might have other reasons. He does not dispute climate change as a facts, but he does dispute the notion that it is manmade. He shows that history is dotted with periods of global warming and cooling – and suggests that this fact alone ought to give people pause. What about the Medieval Warm Period (around 1000 A.D.), for instance, that was certainly not caused by carbon dioxide emissions? The Little Ice Age several hundred years later, also had natural causes, the author writes. Most temperature changes since 1979 were caused by El Niño, La Niña and two major volcanic eruptions (in Mexico in 1982, and in the Philippines in 1991, respectively). Above all, he argues that the climate may well keep changing even without external reasons (such as volcanic eruptions or carbon dioxide emissions). “All this temperature variability on a wide range of time scales reveals that just about the only thing constant in climate is change. This makes the identification of an ‘average’ climate state very difficult, and ‘normal’ climate nearly an oxymoron” (pp. 4-5). Spencer argues that science is hardly advanced enough to identify the true reasons for the rise in temperature with any amount of certainty. One of the possible causes he cites, however, is the so-called PDO phenomenon, “The Pacific Decadal Oscillation” (p. 14). Even the warming of the Arctic, often cited as an irrefutable argument for a climate change caused by greenhouse gases, does not actually quality as evidence because the temperature in the Arctic is no higher than it was in the late 1930s and early 1940s – a time when the PDO was also going through a positive, warm phase, by the way. Spencer criticises the IPCC or “United Nations’ Intergovernmental Panel on Climate Change,” that was formed in 1988. “Now, one would think that the IPCC reached its conclusion that mankind very likely caused the recent warming after ruling out natural climate variability, like that associated with the PDO, as a cause. But the truth is that they never seriously investigated it. The IPCC has taken for granted that there are no natural variations in global average temperatures once one gets beyond a time scale of ten years or so” (p. 16). “The possibility that these natural modes of climate variability might explain a good part of climate variability in the last 100 years has been largely ignored” (p. 109). According to the author, scientists often simply divide interconnected event into cause and effect without producing factual evidence why it could not be the other way around. An example of this is the undeniable connection between cloud cover thickness, on the one hand, and a rise in temperature, on the other hand. “How did the researchers know that the warmer temperatures caused a decrease in cloud cover, rather than the decrease in cloud cover causing the warmer temperatures?… If researchers are not careful about distinguishing cause and effect when observing cloud and temperature variations, they can be fooled into believing that the climate system is more sensitive than it really is” (p. 73). The campus where he works published a press release on these findings, which are no doubt highly significant in the climate research context, yet the press release was not quoted anywhere. Spencer critically discusses the ways in which proponents of the idea (that mankind or carbon dioxide emissions are responsible for the climate change) handle other scientists who do not share this assumption. Starting on page 32, he identifies 15 different propaganda techniques that are applied by proponents of this theory. Dissenters are demonised as “climate change deniers,” and generally suspected of selfish motives, in order to discredit them. Spencer reports that certain scientists had no qualms about withholding or suppressing data and scientific evidence that failed to match their concepts. Spencer recounts an e-mail correspondence among leading IPCC climate researchers in 2009 which suggests that there were plans to destroy or withhold temperature data that failed to back the own hypothesis (p. 35). If true, this would mean that an open academic debate is being jeopardised. It is one of the author’s points I wholeheartedly agree with – never mind what I think about his hypotheses. It is an essential trait of science to engage in open dialogue about differing or even controversial research findings so as to get closer to the truth. The author is quite right to lament the highly politicised discourse of climate research, which stands in the way of gaining new insights. He also correctly criticises that the media are fond of propagating apocalyptic scenarios while neglecting converse research findings. Even the most absurd and misguided hypotheses of an impeding climate catastrophe are instantly picked up by the media, whereas respectable scientific findings that refute them are largely ignored in the media coverage (p. 55). In short, Spencer wrote a fascinating account, and I highly recommend this book to anyone. Of course, weighing the arguments traded in the climate debate is not easy for readers who are not academic insiders or indeed climatologists. I find it undeniable, however, that the research in this field is too heavily charged with political motives to be unbiased and objective. Perhaps, or so the author argues, the almost religious belief in a final climate apocalypse will eventually turn out to be one of the biggest cases of mass hysteria in the annals of mankind. The problem he has with this is that it will precipitate far-reaching regulations that are likely to increase global poverty. For if you believe in the theories of the carbon-dioxide-triggered climate change, you will consequently favour forms of energy production that are economically inefficient. This will in turn result in a misguided allocation of resources, and price hikes for virtually everything. R.Z.